The announcement didn’t really come as a big surprise to anyone who has been following the company. Netflix announced last that it was planning a significant expansion into Europe in 2014, and there have been hints that the service would be coming to Germany and France ever since. One of the details not mentioned in the announcement was the actual launch date. Netflix said Tuesday that it will reveal further details “ including pricing, programming and supported devices” in the coming months, but there have been reports that the launch will happen in September. This will be Netflix’s first major international expansion in two years. The company launched the UK and Ireland, Denmark, Finland, Norway and Sweden in 2012, but only added the Netherlands to that list in 2013. By year’s end, Netflix is going to be available in 47 countries around the world. Netflix CEO Reed Hasting said during an investor call last year that he believes that Netflix will eventually make 70 to 80 percent of its revenue in markets outside of the U.S. During its most recent quarter, subscription fees customers in international markets made up for 25 percent of Netflix’s revenue. International expansions are coming at a cost for Netflix, as the company needs to spend money for local content and advertising. However, strong international growth has helped Netflix to offset some of those costs in recent months, and executives said during the company’s most recent earnings call that they expect Netflix to be profitable in existing international markets by the end of the year. As NewFronts 2014 comes to an end, new research asserts that original digital video content consumption for adults in the U.S. increased by 15% compared to last year. Around 52 million adults now tune into original video content each month, with the ability to choose their own schedule being a major driver for many viewers. You may or may not care for Kevin Spacey’s thick Gaffney accent and screen-mugging in House of Cards, and mileage on the resurrected Arrested Development can vary—but there’s little debating the fact that Netflix has changed the game. In fact, it’s changed the game a couple times over by now, first heralding streaming entertainment as the new distribution model, then bringing streaming services legitimacy as original programming developers in their own right. These dual achievements are noteworthy for a number of reasons, not the least of which is that it says something insightful about the nature of content marketing. Small business owners struggling to understand the importance of original content development can look to Netflix for a neat, ready-made analogy. To begin with, note that content marketing encompasses two basic tenets—there’s content curation, and there’s content creation. Curated content is anything that was written by someone else that you happen to be retweeting, repinning, or sharing on your company Facebook page; it may be a blog from one of your industry peers, it may be an interesting news story from Business Insider or The Wall Street Journal, or it may simply be an Internet meme that you believe will be engaging to your readers. Curated content is useful because it helps you prove that you’re engaged in your industry, and it offers you plenty of fodder for your own content sharing channels. 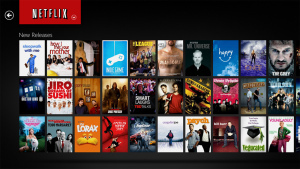 When Netflix first debuted its streaming service, it was essentially a content curator. Back then there was no House of Cards or Orange is the New Black or Hemlock Grove or what have you. What the service provided was access to movies—most of them older, some recent, none of them original to Netflix. The same was true of the TV offerings. There was plenty of content to be found on Netflix, and clearly enough to make the company appealing and sustainable—but there was nothing to brand any of that content as uniquely Netflix. So what was the problem with Netflix relying on curated content forever? Simply put, there was no real reason for people to pick Netflix over other, competitive services. Without original programming, there wouldn’t be much reason to pick Netflix over Amazon Prime, for instance. As such, Netflix got wise and started building its own stable of shows—and now, if you want to check out such widely talked-about, critically acclaimed, Emmy-winning shows as House of Cards or the second coming of Arrested Development, you have to get Netflix—simple as that. Exclusivity has given Netflix power, and it’s no surprise that Hulu and Amazon Prime have started adopting similar strategies, creating original programs of their own. The implication for content marketing is probably pretty clear: While curating content can add context, depth, and variety to your social media platforms, original content is a critical, integral component. It’s what gives your brand a voice, a point of view, and a sense of exclusivity. It’s what ensures that people have to connect with your content distribution channels, rather than just stick with your competitor’s blogs, with Business Insider or The Wall Street Journal. Curated content has its place, and ought never be neglected in your own content marketing endeavors—but if you don’t have a blog, press releases, and other avenues for sharing original content, you’re simply not offering readers sufficient reason to stick with your content channels.